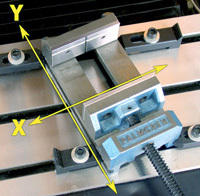 CNC Coordinate System Rotation: CSR matches the machine to your vise. Coordinate System Rotation: CSR matches the machine to your vise. This option is made specifically for the machinist who is constantly breaking down and setting up new fixtures and vises. By simply touching off two points along the edge of your fixture, the control will automatically rotate the machine coordinate system to match your fixture/part saving you time and money. With CSR your vise,fixture or part does not have to be lined up with the machine, CSR eliminates aligning the vise with an indicator. CSR is very accurate. Job set in minutes. Both automatic (with the CENTROID DP-4 Probe) and manual touch off set up can be used. See video here..